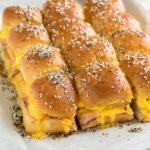 These Cheesy Ham and Egg Baked Breakfast Sandwiches are my spin on traditional funeral sandwiches. A truly amazing treat I first ate when living in Alabama. 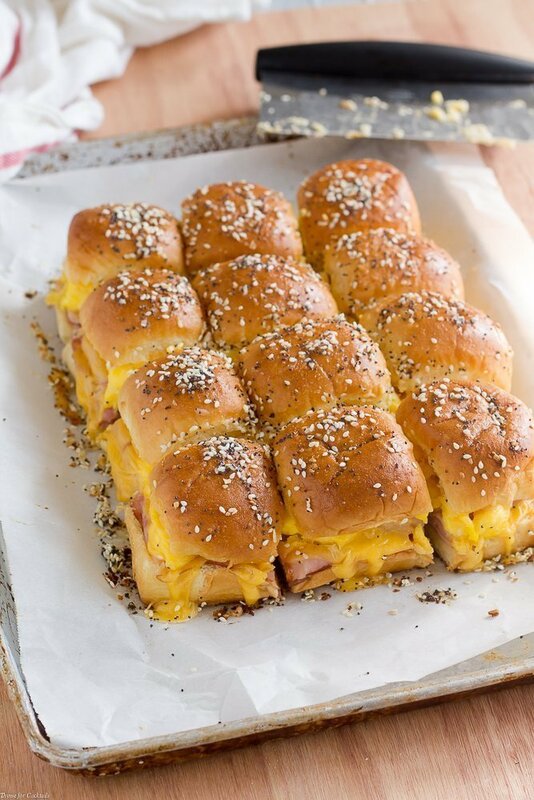 You make them by piling deli ham and Swiss cheese on sweet rolls. Then smother them in a sweet tangy butter sauce and bake until golden brown perfection. This variation has scrambled eggs, a savory garlic butter sauce, and everything bagel seasoning instead! There are advantages to preparing these Cheesy Ham and Egg Baked Breakfast Sandwiches the night before. One is the garlic butter really soaks into the sweet rolls. This results in the most heavenly buttery and crispy edges when baked. Secondly you can sleep in a little longer! Just preheat the oven while you make coffee then sit back and relax for 20 minutes until they are golden brown and gooey AF! Now if you happen to have leftovers, which would be really surprising tbh, simply reheat them in the microwave for 15-20 seconds. You could even get away with freezing them for breakfast throughout the week. I would recommend cooling them completely, then wrap individual sliders in parchment paper. You can store the wrapped sandwiches in a large resealable plastic bag in the freezer. 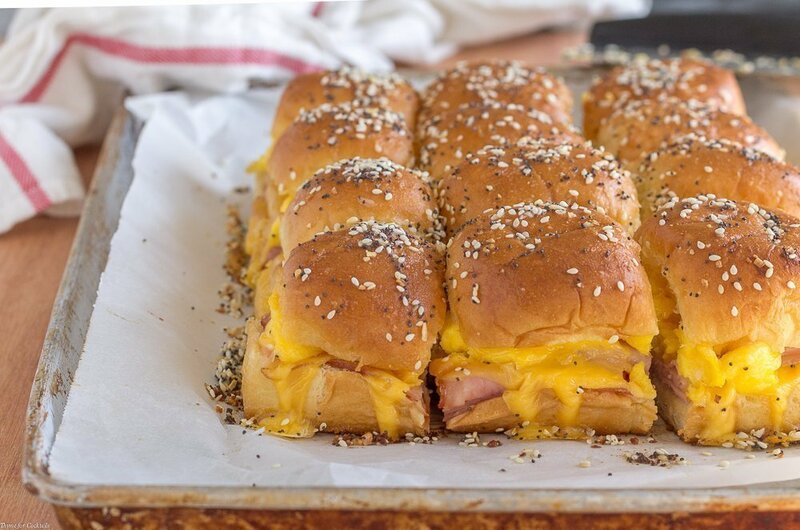 I hope you like these Cheesy Ham and Egg Baked Breakfast Sandwiches as much as my crew does. If you love this breakfast sandwich slider recipe, you can find more like it by checking out my Breakfast section! For daily recipe inspiration, subscribe to my newsletter, follow me on Instagram, and for generally inappropriate humor follow like me on Facebook! Preheat oven to 350°F. Cut rolls in half horizontally without separating them. Set aside. In a medium bowl whisk together eggs and milk. Heat 2 tbsp butter in a large skillet over medium low heat. Add eggs and scramble to desired doneness. Salt and pepper to taste. Place bottom half of rolls in a 9x13 inch baking dish. Evenly layer ham over rolls. Spread eggs over ham, top with cheese slices. Replace top half of rolls. Cover with foil, bake 15 minutes. Remove foil, bake 3-5 minutes until golden brown. Let sit 5 minutes before cutting. Serve warm. 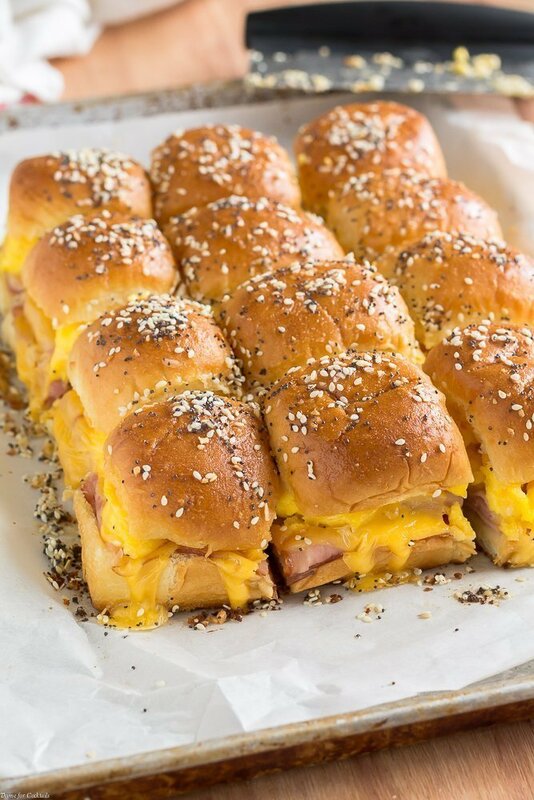 We just had baked ham and cheese sliders last night for dinner, so these really caught my eye when I landed on your page. Never thought of them for breakfast, great idea!! These breakfast sandwiches sound so delicious! Who can say no to ham, cheese, and egg. YUM! These sound really good. Just wonder if you could make them and freeze them for a quick breakfast sandwich anytime. Another add on is spread mayo on bottom halves before the ham. Adds another layer of good flavor. Cheri, you can definitely add your favorite toppings! Very tasty! I scrambled the eggs the night before and assembled the sandwiches. Put them in the refrigerator over night and baked for 25 minutes, but if I do it again, I would cook them for only 20 minutes. When I got home from work there were two left, popped in the microwave for 15 seconds, Yum! Debbie – I am so glad you enjoyed them. You inspired me to make them myself and shoot new pictures to update this post! I will be sure to mention to bake time. Keep in mind oven temperatures can vary. Have a wonderful day! How many eggs did you use? I saw them in the directions, but not listed in the ingredients.